Frogs prayed for a king but got a log. 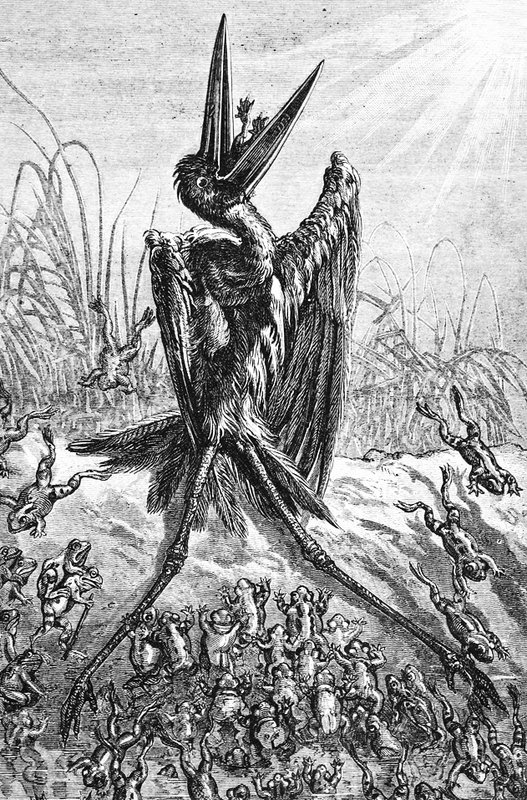 Prayed again and got a stork who started to have a feast on them. 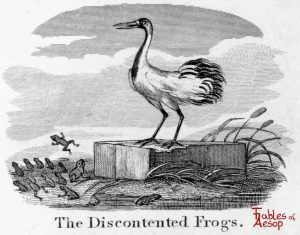 The Frogs were living happily in a swamp that just suited them; they went splashing about caring for nobody and nobody troubling with them. But some of them thought this was not right; they should have a king. They therefore sent a petition to Jove to give them what they wanted. “Mighty Jove,” they cried, “send us a king that will rule over us and keep us in order.” Jove laughed at their croaking, and threw down a huge Log. The Frogs were frightened by the commotion in their midst. After a time, seeing that it did not move, one or two of the boldest of them ventured towards the Log, and even dared to touch it. 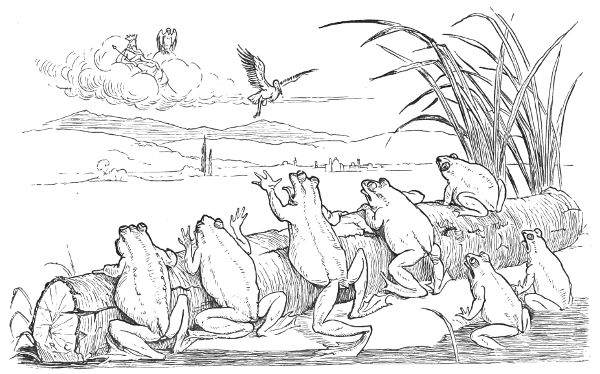 Then all the Frogs came and did the same; and for some time the Frogs went about their business every day without taking the slightest notice of their new King Log. 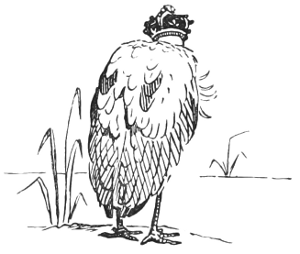 But this did not suit them, so they sent another petition to Jove, and said to him, “We want a real king; one that will really rule over us.” This made Jove angry, so he sent among them a big Stork that soon set to work gobbling them all up. The Frogs repented too late. Requested they might have a king. Or who was frighten’d, who was mash’d? For fear of what he next might do. Who quickly sent them down a crane. Legions of frogs stopp’d up the way. Around the monarch’s person prest. Leap’d up, and so the fraud detected. Who can describe his feelings then? And made the whole transaction known. For their old form of government. Nor make a change they may repent. 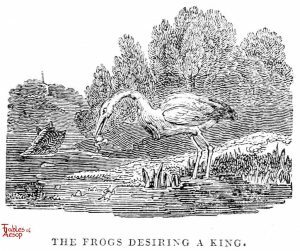 The Frogs were grieved at their own lawless condition, so they sent a deputation to Zeus begging him to provide them with a King. Zeus, perceiving their simplicity, dropped a Log of wood into the pool. At first the Frogs were terrified by the splash, and dived to the bottom; but after a while, seeing the Log remain motionless, they came up again, and got to despise it so much that they climbed up and sat on it. Dissatisfied with a King like that, they came again to Zeus and entreated him to change their ruler for them, the first being altogether too torpid. 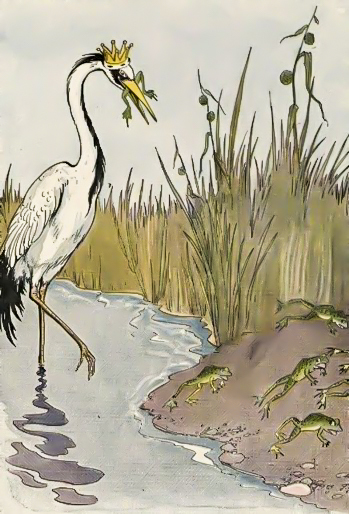 Then Zeus was exasperated with them, and sent them a Stork, by whom they were seized and eaten up. 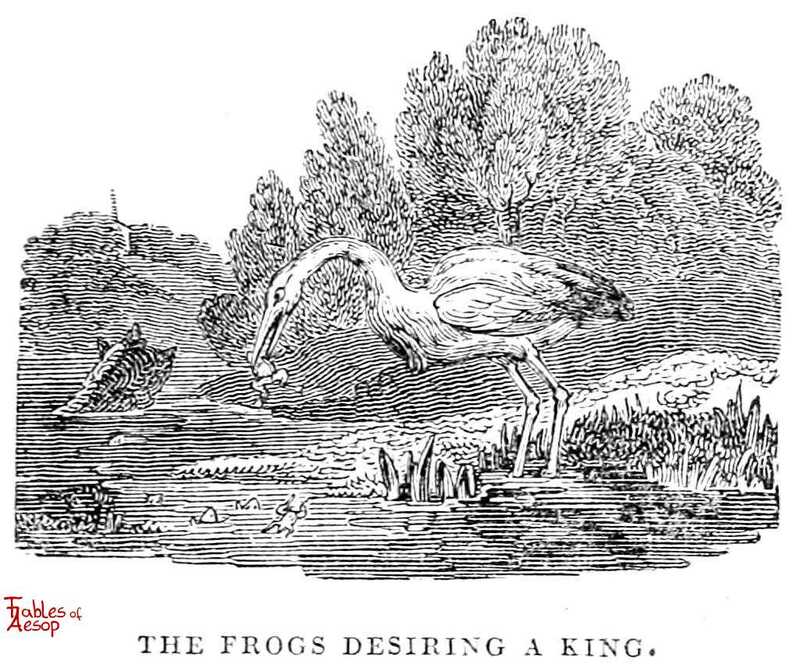 THE Frogs, living an easy free life, every where among the lakes and ponds, assembled together, one day, in a very tumultuous manner, and petitioned Jupiter to let them have a king, who might inspect their morals, and make them live a little honester. Jupiter, being at that time in pretty good humour, was pleased to laugh heartily at their ridiculous request; and throwing a little log down into the pool, cried, There is a king for you! The sudden splash which this made by its fall into the water, at first terrified them so exceedingly, that they were afraid to come near it. But in a little time, seeing it lay still without moving, they ventured by degrees, to approach it; and at last, finding there was no danger, they leaped upon it; and, in short, treated it as familiarly as they pleased. But not contented with so insipid a king as this was, they sent their deputies to petition again for another sort of one; for this they neither did nor could like. Upon that, he sent them a Stork; who, without any ceremony, fell devouring and eating them up, one after another, as fast as he could. 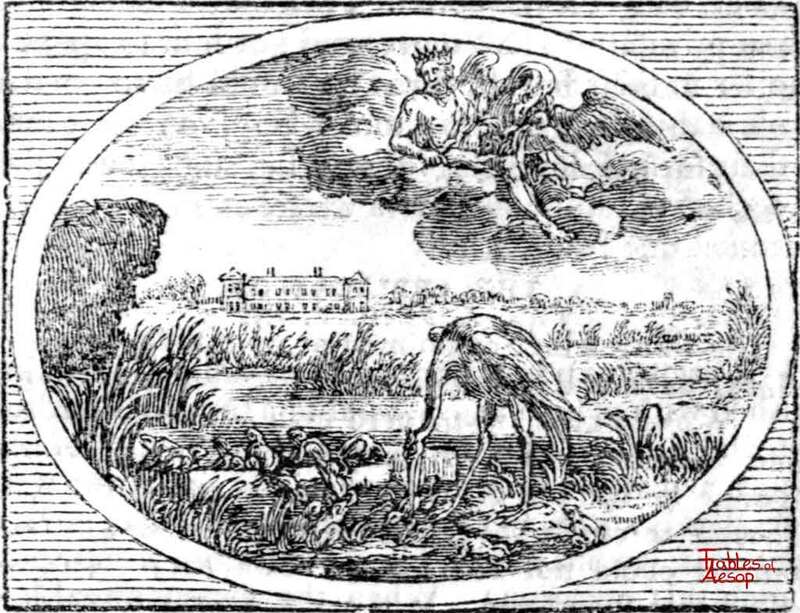 Then they applied themselves privately to Mercury, and got him to speak to Jupiter in their behalf, That he would be so good as to bless them again with another king, or restore them to their former state: No, says he, since it was their own choice, let the obstinate wretches suffer the punishment due to their folly. 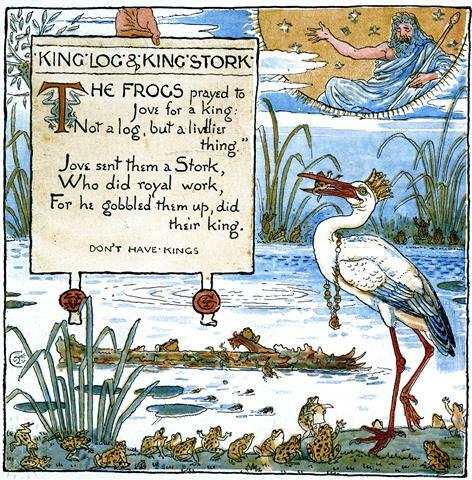 In the days of old, when the frogs were all at liberty in the lakes, and grown quite weary of living without government, they petition’d Jupiter for a king, to the end that there might be some distinction of good and evil, by certain equitable rules and methods of reward and punishment. Jupiter, that knew the vanity of their hearts, threw them down a log for their governour; which upon the first dash, frighted the whole mobile of them into the mudd for the very fear on’t. 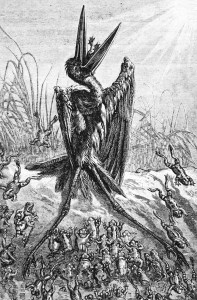 This panick terror kept them in awe for a while, ’till in good time, one frog, bolder than the rest, put up his head, and look’d about him, to see how squares went with their new king. Upon this, he calls his fellow-subjects together; opens the truth of the case; and nothing would serve them then, but riding a-top of him, insomuch that the dread they were in before, is now turned into insolence, and tumult. This king they said was too tame for them, and Jupiter must needs be entreated to send ’em another: he did so, but authors are divided upon it, whether ’twas a stork, or a serpent; though whether of the two soever it was, he left them neither liberty, nor property, but made a prey of his subjects. Such was their condition in fine, that they sent Mercury to Jupiter yet once again for another king, whose answer was this: They that will not be contented when they are well, must be patient when things are amiss with them; and people had better rest where they are, than go farther, and fare worse. The mobile are uneasie without a ruler: they are as restless with one; and the oft’ner they shift, the worse they are; so that government or no government; a king of God’s making, or of the peoples, or none at all; the multitude are never to be satisfied. Minus perferte, maius ne veniat malum.